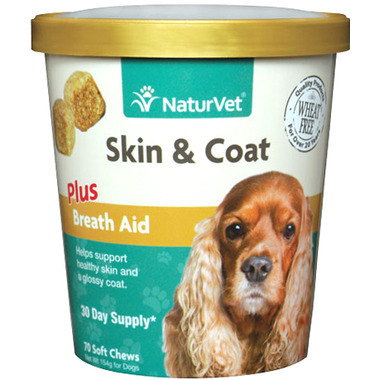 Naturvet Skin & Coat Plus Breath Aid Soft Chews are designed to improve the quality of you dogs skin and coat. Rich in Omega 3, 6, and biotin, these soft chews are healthy and productive with proper use. Return some of that never ending love your dog dishes out by promoting healthy skin, coat, and a much needed boost to their breath! Ingredients: Flaxseed, Glycerine, Potato Starch, Brewer's Dried Yeast, Lecithin, Canola Oil, Fish Oil, Natural Flavoring, Parsley Leaf, Deionized Water, Ascorbic Acid (Source of Vitamin C), Citric Acid (a preservative), Natural Mixed Tocopherols (a preservative), Rosemary, Sorbic Acid (a preservative), Vegetable Oil, Vitamin E Supplement, Zinc Sulfate, and Biotin. the dogs love the product and it does wonder to their coat.